Author: J. Anthony Lukas; Format: Hardcover; ISBN: 0684808587; Publisher: Simon & Schuster; Release Date: 1997; List Price: $32.50; Length: 875 pages. Condition: Very Good. First blank page is dated in ink and embossed. Jacket and cover are both still in overall great shape, binding is strong, and pages are otherwise unmarked. Same cover design as that shown here. 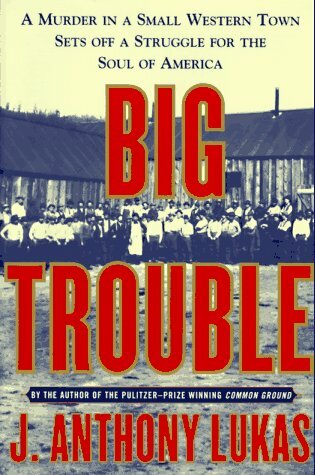 In Big Trouble, Pulitzer Prize-winner J. Anthony Lukas weaves what may be his most brilliant narrative, dramatizing the class struggle of turn-of-the-century America. Featuring an extraordinary cast of characters that include President Theodore Roosevelt, celebrated Pinkerton detective James McParland, actress Ethel Barrymore, and defense attorney Clarence Darrow, in a kind of non-fiction Ragtime, Lukas's Big Trouble paints a vivid portrait of a fascinating, sensational, and all-but-forgotten 1905 murder case. Priority Mail delivery for this item costs $40.00 at the request of a buyer. Otherwise, the shipping rate given here applies to orders shipped either First Class or Media Mail (depending on product type and package size) within the U.S. and to Canada only. Orders consisting of multiple purchases packaged together ship by any of these delivery methods at a discounted rate, usually for only $1.00 per additional item plus the shipping fee for the first item (determined to be the one with the highest delivery charge). International buyers: please contact us with your destination country for applicable base shipping rates. Multiple purchases that are packaged together save shipping costs for you, too!